Oriental Spruce 'Skylands' is always yellow, no changes there. But the tamarack is changing it's colors, very soon the needles will fall. The weather is much colder and darkness is falling a whole lot earlier. Dropping the quest to finish the Castle Aaargh has resulted in me walking around in circles for a day or two, not really sure what to concentrate on. Carl cut a lot more stone for mortaring which will wait until Spring, now. But for the last few days, I finally shook my gardener's attention deficit syndrome (GADS) and focused on cleaning out the beds. I'm still a long way from done, though. I took a little stroll through the garden this afternoon to see which way to go first with my cleaning efforts. Yup, no doubt about it, the east hill of the Quarry Garden is Tired with a Capital T. Time to clean it up. So much greenery. Where's the rocks? A few short weeks ago, the same bed looked so much different, ah, but like I said earlier in this post, this has been a week of change. Across the pond, there's the same bed from the other side with all the rocks exposed. Someone better get on removing those lilies pretty soon too, the fish should be safe since I haven't seen a heron in a few days. I just can't pull out those rudbeckias yet, though. They're still blooming their hearts out for me, despite temps in the low 30's at night. I think the rocks hold so much heat that it's enabling them to keep on putting on a show. Even a few Blue Butterfly delphiniums are still valiantly showing off yet, too. A little tattered, but still glorious. 'Limelight' hydrangea....nothing remotely lime about it right now, just pink perfection. The quality of the light has changed so much, to a harsher light and deep, dark shadows. 'Tiger Eye' sumac has lost all it's tiger eyes and is now just a bunch of sticks on top the Quarry. Thuja occidentalis 'Sunkist' is definitely living up to it's name. When the sun hits that yellow foliage late in the afternoon, this tree glows. More rudbeckias, such wonderful flowers these are, all of them volunteers from years past. The extent of my fall decorations......a pumpkin Briana brought over for us, plunked in an urn. Whoo-hoo. I go all out, don't I? And I haven't yanked out the marigolds, thunbergias or the sweet alyssum, either. While I was clearing out foliage on the Quarry hill, this little coreopsis charmed me with it's alluring face. The pond has come up a little for fall, for awhile there, it was rather low. I was feeling rather low too, so I gave up working on this part of the yard and wandered over to the front of the house to see what mischief I could get into over there. 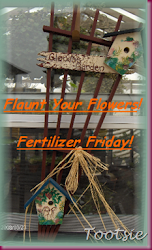 Though the petunias are still blooming, well, it's time. Time to change the scenery. The hyacinth beans did a fantastically exuberant job of hiding the hill (and the dwarf conifers and the big rocks and probably a few garden shovels and tools) under their twining vines. They grew up into the conifers and the apple trees, wow, talk about ambition. But now they're tired, so bring me a trailer, would you? Why, thank you, that is very accommodating of you! Don't you just love my choice of trailer hauler....my car. I know, what new madness is this on my part, but I didn't have any other way of hauling the big trailer around other than my tractor (and it needs a new water pump) and well, the car was here and handy. And the lawn is really sad here anyway and needs work. Nope, we didn't haul in any more rocks, those were all there, hiding under the greenery. Back to seeing rocks for another six months, or until the snow covers them up....but I'm not complainin'. Oh, and you can go dump the trailer now, if you would, please. When Carl came home from work he helped me finish this bed. Though I don't mind working alone, it sure goes faster when you have help. We worked right up until dark and then went in to a feast of roast chicken and vegetables in the crockpot. I love the crockpot, it's always got something delicious cooking. I didn't have the heart to yank out this 'Avalanche' petunia yet. And neither did Carl. So, that's some of the changes in the flower beds, now let's focus on some of the other changes this week. Okey, dokey......now I feel a Fair Warning is in order. The rest of this post is not about gardening, so feel free to click on outta here right now, OK? I don't want to bore anyone with a bunch of sappy-sappiness! Tootsie still hosts Fertilizer Friday even though she has been going through so many changes in her life, getting ready to move to a new home and the bittersweet feelings that brings up. I think of her often, whenever you read her blog you can tell she's such an optimistic person and so vibrant. She does her best for her family even though I'm sure there are worries, too. We all have some worries, don't we? My friend Ann became a grandmother this week, congratulations to her and her family on the wonderful addition of baby Nathan! What changes and emotions a baby brings to a household upon it's arrival...almost overwhelming at times and fraught with highs and lows and sleepless nights. We all knew this day was coming. It wasn't a surprise. He's been looking forward to moving out since he was fifteen years old and now he's twenty-one. All parents know they can only keep their children for a little while, and then you have to let them go. We're proud and happy for him. He's ready. We were all feeling the growing pains of being crammed together and a lack of privacy at times; I was looking forward to no more white socks and shirts on the floor and coats hanging off of chairs, to having all the glasses in the cupboard again and not in his room, to not knowing if I should be cooking a meal for six, five, four, three or two people every night, to a few less dishes, a lot less laundry and a lower utility bill, not necessarily in that order. Dave wasn't crazy about the TV we watched; we weren't crazy about his music all the time either; he disliked it when we had company playing cards right below his bedroom, especially when the card games lasted late into the night and got heated with whooping and hollering, and not having enough bandwidth on the computers was a thorn in all of our sides. Carl's junk is a problem for everyone (except Carl, lol) who wanted more room to work in the outbuildings and there was no suitable compromise that could be worked out amicably in that direction, either. You tell yourself this is all for the best. You know in your heart it really and truly is. The days when I tripped over a toddler's pile of blocks, or later on, a pile of Legos half-built into a new race car or later on, a stack of school books and undone homework and much, much later on, a pair of steel-toed work shoes on my way to the bathroom are over. Or the days I can't find a clean glass in the cupboard or wonder who used up all the ice cubes and there's a seemingly endless pile of wet towels and the vent in the bathroom is still on an hour after a shower and there's no room to park in the driveway because their friends are always here and are we really out of milk AGAIN and you wonder if you'll ever have your house back to yourself.....? Well, those days are over for me, too. I was reliving the first days of new motherhood with Ann the other day, remembering what it was like to bring the boys home as babies. How overwhelming it felt at first until we settled into our new routines. I was an older mother than most of my friends; though we married at 20, we did not have Joel until we were 28 and David, four years later, at 32. We'd had eight years of marriage under our belts before we started our new life as parents. It was a change, all right, but we loved it. These are just some of the hijinks with this one. There was never a dull moment. And now those days are over. Last night he came home with an accepted application to an apartment. He'd been looking for some time, but this was it and he could move in ASAP. So tonight we got a good start. I did fine while we helped him move out his furniture and his clothes and whatever belongings would fit in our cars. I packed up his vast collection of teas (he loves tea...I'm still not sure if he's my kid, but he had me hooked on a few of the flavors) and his coffee pot (ditto on the coffee, neither Carl or I were ever coffee drinkers) and emptied out an entire kitchen cupboard that used to be his domain. Then I started to get misty when I saw his mattress standing up by the front door in the dining room....I remembered how excited he was when he was a little boy and we bought him the big bed for his own. I remembered how hard it was for me to move him from the downstairs nursery (which in reality is the size of a broom closet) to the bedroom upstairs on the second floor where he'd be right across the hall from his big brother. It felt like I was abandoning him to the wilderness just by moving him upstairs when he was three years old. But he loved it, and never even needed me to hold his hand. That's always been Dave. Mr. Independent. My mistiness dissolved into eyes full of tears on the ride to town. I rode with him in his VW bug and he was going on about how much he loved his car and his delight with the gas mileage and I was staring out the window, watching the miles go by and not saying much of anything because, well, I couldn't. I didn't want to flat out break down and blubber. This wasn't the time for it, but when he asked me if I was ok, I fessed up. "Nope." Sniff, sniff. Sob. What I wanted to say was, "I'll miss you more than you know; I know you didn't want me to carry on like a menopausal maniac, but damn it, this is the hardest thing I've had to do yet. I know you'll only be thirteen miles away and that your dad will see you every day at work (lucky bugger) but I won't. I know you weren't all that happy at home and I know this is great and for the best and the Right Thing To Do------ in my mind I know all of this, but in my heart, well, you're still my baby and you always will be. And I have to let you go. But they never told me at the hospital twenty-one odd years ago how hard it would be, and they sure don't prepare you for the reality. I thought labor was hard? What did I know? This is excruciating." But I didn't say that. I said, "I guess I thought I could hold it in the road, Dave, but I'll miss you so much, sorry for the tears." "Well, it's not like I'm moving out of state," he said quietly. "I'll be back to visit." "I know," I said. "I'm just a little, ok-- a lot, sad." When we carried all his stuff into his freezing apartment (54 degrees, but he doesn't want to turn the heat on yet) and the car was empty, I nearly lost it when Carl grabbed him and gave him a bear hug, and said, "I'll see you tomorrow, love you," and left. It was my turn, and I quickly grabbed him (in front of his sweet girlfriend and her mom) and gave him a too-short hug, whispered in his ear, "I love you," and did my best to say a cheery goodbye to everyone on my way out to our waiting car. I didn't say much on the way home. Carl did all the talking, how nice the apartment was, how different it would be now around the house, how we'll have more time for fun stuff once the garden is put to bed for the winter. I was trying SO hard not to cry, but finally after sniffing a few times, Carl asked, "Are you coming down with a cold?" Oh, boy, poor man, he had to ask. I started crying then and there was no mistaking it wasn't a cold. "Aw, c'mon," Carl said, "It's going to be ok. He's not THAT far away." I know. He's not off to war, or out to sea. And I'm good with it. Really I am. I'm just me. Change is hard, but we will all adjust. Since we decided mortaring was out of the question for the rest of the year, on Sunday afternoon I started cleaning up the gardens, pulling out annuals and newly sprouted weeds and trimming back perennials. Carl is still hard at work cutting stone for the castle, which is good; the more rock we have cut ahead of time, the better. We were both working away on Sunday when it started to rain. Well, that put a damper on things, we ran to put hammers, chisels, shovels and trowels away and then stood in the barn watching the water drip off the roof. Carl said, "Do you want to go for a ride?" "I'm way ahead of you," I said as I ran for the house to get cleaned up. I love old barns and farmsteads and even Carl has come to appreciate them over the years despite not being raised a farm kid. I usually take pictures out of the car windows, not the best photos in the world, but we do enjoy looking back at all the things of interest and beauty seen on our little afternoon jaunts. Isn't it a beauty? I think it's my favorite barn of all. The construction and design is perfection; it's round, it has a stone basement and the roof is fantastic, complete with the awesome weather-vane. I'd love to see the inside of the barn, I bet it's as stunning as the outside. Many of the farms are so well-kept; take this one for instance, even the silo is color-coordinated with the barn. My hat is off to the people who own beautifully maintained farm buildings. 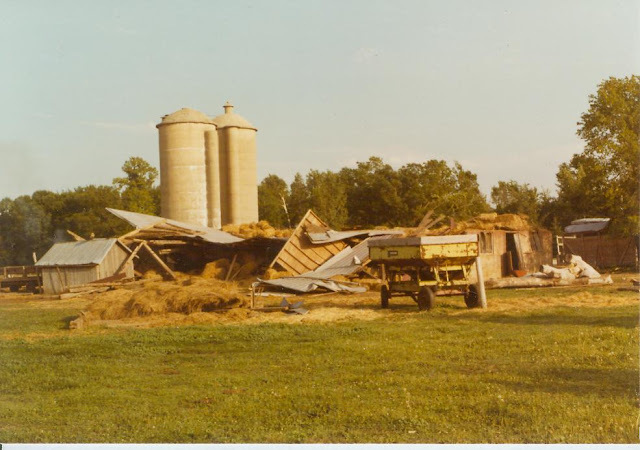 I know only too well what a lot of work it is and the huge expense involved in keeping a barn and silos and outbuildings in good repair, especially if the farm is no longer in operation. I hate to see barns falling apart from neglect, but I fully understand why it happens. The cost of putting a new roof on your house is one thing, but now think about multiplying that cost a dozen or more times. That's why we are losing so many barns across the state, it's just too expensive to keep them up. 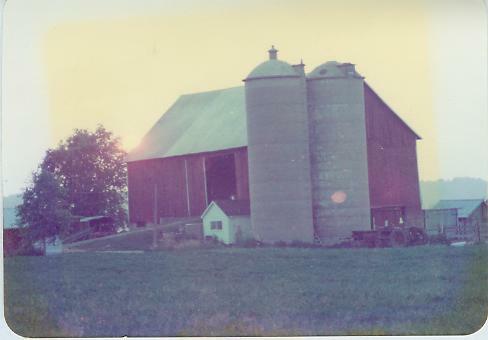 This was the barn on our farm before it was destroyed in the early 1980's. Our barn was lost to a tornado. (If you'd like to read about the storm, here's a link: Our Barn I wish I'd thought to take more pictures of our farm back in the day, but you know how it is, especially when you're young, you think you have plenty of time to take photos. And why should anyone take pictures of the things you see every day? But the sad part is, now I wish I had pictures of the inside of our long-gone barn, the haymow, the stanchions, the cows, silos, machinery, tractors we once had, heck, all of it, for remembrance. It's gone now. When I was younger, I'd taken hundreds of pictures of places we had visited and they are very nice to remember the trip, but I should have been taking pictures of the every day things I lived with, the things I treasured, the people and places I loved. I'm not as camera shy anymore, not because I look great, but because I figure it's only downhill from here on out; like many of the barns around here, without a new roof or a facelift, I might just fall down in a heap, too, so best to remember me the way I am, before it's too late. Ha. Beautiful brickwork on this old silo. The windmill has seen better days, maybe it needs rescuing? Can you spot three of my favorite things in this photo? This little shed (privy maybe?) caught my eye, the sun was just breaking through the low clouds after the rain. (And you thought people gave you blank looks when you told them you were a Blogger??) Carl will tell people we meet, "Karen is a Blogger," and some of them don't know if they should congratulate me or step back in case it's contagious. My dear mother still pauses when I tell her I wrote another blog post. "Oh, you're still doing....that? What's a 'blog' again?" But the highlight of the drive for me was the abandoned granite quarry in Redgranite, WI. We don't get here very often, but when we do, it is always a treat. This is a gorgeous quarry right in town and very pretty, I can only imagine how beautiful it must have been a few weeks ago before the trees passed their autumn peak. But there was still some leaves to appreciate anyway. Just look at all the gorgeous granite left behind from the 1920's. Do you know how tempting this stuff is? But we behaved and left it all behind. That's me up on top the pile. Outcroppings of the beautiful stone are all that show now since the water has filled in the vast hole in the ground. This is a favorite quarry for teaching people how to scuba dive since it is very deep. I had to go and stand by this monumental piece of granite; there were so many of these lovely slabs here, what a statement just one of them would make in a garden. (I don't know what the arrow painted on the rock is for, but if it has anything to do with shipping this piece to our garden, I'm all for it.) Carl and I could just picture a smaller version of Stonehenge (Granitehenge?) built out of these beauties. Ok, dream sequence is over. All too soon, the sun was setting and it was time to go. Even though the rain put us another coupla days behind on garden clean-up, this was a wonderful little trip. And Joel found the geocaching to be fine, too. Time to head back to our own quarry rocks. 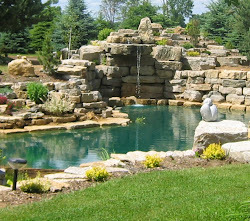 They aren't granite, but they're ok.
Ok, I'll stop coveting my neighoring county's rocks now. I will. How It's Going: New Rocks!